A Play, A Healthy Picnic And A 7 Mile Hike Down A Mountain - What A Glorious Day! GET READY TO GO RAW! Going out with friends can often wreak havoc with your diet, exercise regimen and alcohol consumption! Especially on 3 day holiday weekends like this. But the outing yesterday with our friends Ray and Rory left me totally invigorated - albeit a bit sore. A while back, they invited us to go see the play, " Hairspray". Doug and I saw it many years ago on Broadway but this play experience sounded quite unique. Usually when going to a play, you meet friends for a few drinks, eat a rich "pre fix theater dinner", see a play in an intimate playhouse, eat a cookie at intermission and drive home after the play. This experience was quite a bit different. On the top of mount Tamalpais is an outdoor theater where they have been producing plays for almost a century! The theater, filled with massive stones that create some 4,000 seats, overlooks San Francisco Bay- a view so amazing it's almost distracting! A school bus takes you and your "stuff" up to the top of the mountain. We brought cushions to sit on, a healthy picnic lunch, water, etc. We spent almost 5 hours picnic'ing, enjoying the view, our friends, the play and the perfect weather. But that wasn't the end of it! We put our stuff back on the bus and then hiked all the way down mount Tamalpais! I have to admit, I was quite a bit nervous about signing up for a 7 mile hike but I'm glad I did. Ray lent me his walking polls which I had never used before and were a godsend. I'm definitely getting a pair of these! The views down the trail were indescribable. 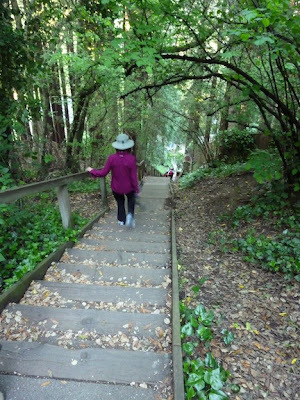 The 671 "Dipsea" steps at the end of the hike that bring you into Mill Valley added an extra challenge (my calves are paying for it today), but I did it! The views on the way down are breathtaking! 671 steps down into Mill Valley at the end of the hike. Figuring out what to bring on a picnic can sometimes be difficult. I wanted something quick and easy! I found some nice, soft, whole grain lavash that would travel well. I picked up some spicy, red pepper hummus that would make a good filling. I tossed a diced tomato and avocado together and put it in a tupperware container with some "fresh fruit protector" and, of course, bought a container of my favorite arugula sprouts! Whole grain lavash travel well and are very soft and pliable. Toss a few chopped tomatoes and avocados together. Buy a package of your favorite sprouts. Cut the lavash in half. Spread all ingredients onto the lavash. So check out the area where you live and try to find a fun, unique and healthful outing for you, your friends and your family! Challenge yourself and have a great time! Lentils are a staple in vegetarian diets. They are a good source of protein and iron and a very good source of dietary fiber, folate and manganese. For McD lovers, replacing a few Big Macs a week with a great tasting lentil burger like this would keep blood sugar levels stable and coronary artery disease at bay! For an extra zing, I added a small can of fire roasted chiles to this recipe! Along with these lentil burgers (recipe below), I suggest a few easy and yummy side dishes. Lentils go really well with corn. Try this Fresh Corn Salad with Red Bell Pepper and Basil. In this post, I'll show you a way to cut the kernels off of the cob without them flying all over your kitchen! Together, corn and lentils make a complete protein! Another good salad to serve with burgers is Vegan Potato Salad. Turmeric gives this salad the yellow tint that you'd find in a traditional potato salad containing eggs. Without the eggs and mayo, potato salad is a healthful side dish! And for dessert, make some of these wonderful Vegan Brownies with Macadamia Nuts and Chocolate Chips. My brother-in-law lives in Hawaii and this weekend he brought me a HUGE bag of macadamia nuts! I can't wait to make my favorite brownies! Macadamia nuts and vegan chocolate chips make these brownies to die for! Make a flax egg by combining ground flaxseed and water. Beat until gooey and set aside. Heat 1 tablespoon of olive oil in a medium frying pan and sauté onion and red bell pepper for 4 or 5 minutes or until soft. Add lentils, green chiles, pepper, cumin, garlic and salt and cook until all liquid evaporates and the mixture is pretty dry. Place mixture into a bowl and add breadcrumbs and flax egg. Mix thoroughly and let sit until the breadcrumbs absorb all moisture. Clean out the frying pan. You will be using it again. Make 6 patties - make them nice and flat so they crisp up when you cook them. If you are not ready to cook them, place the patties on a plate covered with wax paper and put them into the refrigerator. Heat the remaining tablespoon of olive oil in the frying pan and cook the patties until they are brown and crisp, about 5 minutes a side. Serve the lentil burgers on fresh whole grain buns with red leaf lettuce, a thick slice of heirloom tomato and avocado slices. You can also top them with a slices of red onion or sprouts. Serve with Dijon mustard, ketchup or Veganaise. For some added spice, top with salsa! Per serving (burger only): 135.8 calories, 5.6 g fat, 0.7 g saturated fat, 0 mg cholesterol, 4.6 g protein, 13.3 g carbohydrates and 5.2 g dietary fiber. Have a safe Memorial Day and remember our troops, past and present, who have sacrificed so much! Serve this tasty Raw D'oeuvre at your next party! I was preparing to do a photo shoot for my new cookbook last week and was looking for something beautiful to top a raw pizza. While in Whole Foods, I found these adorable arugula sprouts! Not only are they beautiful, their intense spicy flavor makes them a perfect topping for so many dishes, cooked or raw! Top a salad, a raw or cooked veggie pizza or hor d'oeuvres. Put them in a sandwich or over pasta, gnocchi or a baked potato. They will taste as though you just topped the dish with freshly ground black pepper! Spicy, fresh, crisp and packed with nutrients! When a seed starts to sprout, it contains an intense amount of energy. Rich in enzymes, vitamin C and other nutrients, it has the vitality to begin its new life! 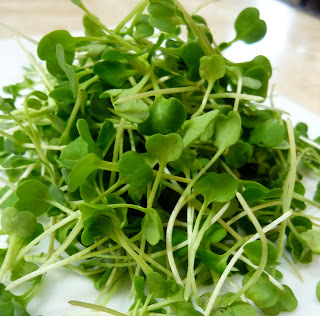 Arugula is very good source of vitamins A, C and K as well as folate, calcium, magnesium, potassium and manganese. It even contains omega 3 fatty acid! If you can't find them in the stores, try growing them. To make raw vegan hor d'oeuves, make your favorite raw cracker. Here I used the recipe for my Sprouted lentil crust only I cut it in half because it makes a lot. Instead of making larger pizza crusts, I make smaller round crackers. You can also use the recipe for Raw Veggie-Seed Crackers. If you don't want to bother dehydrating crackers, use slices of cucumber or zucchini. Make cashew ricotta, also from the raw pizza recipe (cut this one in half also). 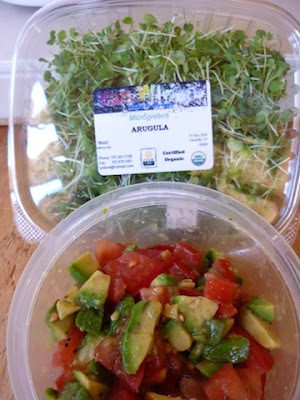 And of course, top with some beautiful arugula sprouts! Encourage Your School To Adopt The 5-2-1-0 Program To Stop Childhood Obesity! Practice These Health Strategies This Summer! My grandson Matisse loves to run and play and eat his veggies! He doesn't watch TV or drink soda. This will help keep him trim and healthy throughout his life. With one third of Americans being obese, it's not a surprise that childhood obesity is also on the rise. After all, it's the adults that feed these children and set the rules. In fact, childhood obesity has more than tripled since 1980! Whether or not your own children are overweight, this statistic effects everyone. Obesity in this country, despite the age, leads to cardiovascular disease, diabetes and other degenerative disorders. It's what's causing our healthcare costs to skyrocket. Most importantly, it's one of the main reasons that this generation may not live as long as their parents. I recently read about a program that promotes good habits in children and I would like to share it with you. The first is the child's personal preferences. Although many children eat some fruit, many avoid vegetables all together. But these habits are often brought on by the parents. Kids eat what you offer them and what they see you enjoy. No one was born craving happy meals. My grandsons love veggies. Why, because that's what they are fed. They help their mom garden and often pick the veggies off the vine and pop them in their mouths. My daughter-in-law helps run a school garden program where they are teaching the students to plant various vegetables and eat the bounty! Much to the parents surprise, the kids are going home and asking for salads! The second issue is accessibility. Schools are beginning to get some pressure to offer more healthful meals (and no, ketchup shouldn't count as a serving of vegetables!). You should encourage your own schools to adopt healthy programs offering fresh salads, whole grains, vegetables and fruits while discouraging cheese drenched pizza and high calorie fried foods with little nutritional value. Another issue is cost. You can feed a family of four at Taco bell for what it costs for a few pounds of organic apples. It's sad but true. But as long as farmers are subsidized to grow corn instead of fruits and vegetables, this fact will remain. However, it you factor the cost of health care into the equation, paying for food that eventually prevents expensive medical bills is a good financial decision. First, if they are watching TV or playing video games, they are NOT reading, drawing, playing a musical instrument, learning to play chess or doing something physical. Hence the term, "couch potato". Second, they are getting exposed to advertising! Marketing junk food to children is big business. In my post, "Fast Food Facts", I showed that the fast food industry spent over $4 billion on fast food marketing resulting in 40% of children asking to go to McD's once a week and 15% of PRESCHOOLERS asking to go EVERY DAY! If you are old enough to remember when kids could safely go outside, you probably are thinking that 1 hour of physical activity is ridiculously small. Your school probably had a physical education program and when you got home, you probably played outside for hours. Then after dinner, you most likely begged to go back out until dark. I grew up in New York City and even I played outside more than one hour a day. But today, for many reasons, kids aren't getting even a minimum of physical exercise. Get your kids in sports or set up play dates in the park, not at the movies. Go for a family hike or bike ride. Put up a hoop and buy a basketball. Just get the kids out of the house and moving! Junk food plus little or no physical activity spells obesity! Foodbeast reported the "7-11 double big gulp holds 200% the average human stomach's capacity". This 44 ounce sugary drink supplies 800 nutrient-free calories! According to Robert Lustig, a UCSF pediatric neuroendocrinologist, "sugar is poison!" - especially the high-fructose corn syrup found in soft drinks. He believes that fructose generates increased insulin resistance. Chronically elevated insulin blocks leptin (a brain hormone) from signaling the body that it is full. So even though a child or an adult is drinking hundreds or thousands of calories from soft drinks, the body thinks it's starving! Bottom line, don't let the kids drink soda. Now, what should they drink? Water is a good substitute for sure. This program also promotes low fat milk but I'm not a big fan of dairy for children. In Dr. Schmidt's book, "Childhood Ear Infections", recurrent ear infections can be virtually eliminated by removing dairy from the child's diet. The book, "Beyond Antibiotics", talks about an ear nose and throat specialist named Dr. Pullen who practices in Miami, Florida. Whenever patients come to him to have tubes surgically implanted in their eardrums (a common operation for children who have chronic ear infections), he puts them on a dairy-free diet for one month. After one month, 75% of the children no longer need the surgery! I wish I knew this when my son was 18 months old and had these tubes put into his ears. There are many dairy free beverages like soy milk, almond milk, hemp milk and rice milk that your children can enjoy. Many juices are also high in sugar and should be avoided. School's Almost Over. Why Bring this up Now? Even though school is about to end, I think the summer would be a great time to try and drum up support for a similar program in your local school. To get some ideas on how to do this, check out Let'sGo! Summer is also a good time to practice these principles. Talk to some other parents and see what they think about the program. I like the simplicity of it. It provides structure and a few rules on how you and your children deal with food, TV, exercise and sugary drinks. It's easier to say, "you haven't had your 5 fruits and vegetables" than just to say, "you need to eat more vegetables". It's more definitive to say, "you've already watched your 2 hours of TV" than to say, "shut that darn thing off, you've been watching it all day!" And once they get into the habit of running around and playing for an hour a day, you won't be able to get them to stop! They'll be begging to play outside until dark - just like you did! What a Wonderful Neighbor to Have! A few miles down the road is a large, windowless, warehouse-looking building right across the street from Merry Edwards, one of my favorite wineries. 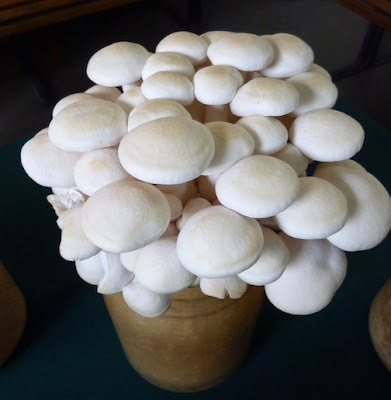 When I found out that it was a gourmet mushroom farm, I could hardly contain my excitement! After living here for 3 years, I finally got a chance to go inside! The only mushroom farm I had ever seen before was decades ago in Maryland where they grew common white button mushrooms. I met their President and CEO, David Law, who together with the Chairman, Malcolm Clark, founded Gourmet Mushrooms in 1977. They were the first commercial grower of shiitakes but now they grow far more exotic mushrooms. Being visionaries and learning the many medicinal properties of mushrooms, they also supply nutraceutical products as well. Bob Engel, their Director of Marketing, gave us the tour. The first thing that surprised me was that the mushrooms weren't grown in big dark drawers filled with sheep manure like the button mushrooms I saw many years ago. Each plant is grown in a pint sized jar filled with sawdust and some water and is inoculated with mycelium. They have about 50,000 jars of mushrooms growing which generate 10,000 to 15,000 pounds of these exotic fungi per week!! There are 50,000 jars throughout the plant filled with mycelium! They had some cool equipment to sterilize the jars, fill them, spray them with water, etc.. After being inoculated, they all are stored in a large room where the temperature and humidity are held fairly constant - around 74 to 76 degrees F and between 75 to 80% humidity. After the mycelium starts growing on the top, (which could take 6 to 10 weeks) a Kinkake machine flips each jar over and scrapes off a bit of the mycelium to stimulate growth. The various mushrooms then go to their special rooms which have an optimal environment. Things move pretty quickly from that point on as they can go from Kinkake to harvest in a little over a week! Trumpet Royales are firm and meaty with caps that can be as big as two inches wide. They like 62 degrees F with 99% humidity. Forest Nameko have glossy caps and a rich amber color. They have a shiitake-like texture but their stems are edible. They like a cool temp of 60% F with 99% humidity. These Nebrodini Bianco are my absolute favorite mushroom! They are dense and meaty - great for vegetarian dishes. These Maitake Frondosa are long known for their health benefits. I love their interesting leafy shape and rich flavor. They are great in a mushroom gravy or in pasta dishes. Alba Clamshell mushrooms have a crunchy texture. Fungi have been used for centuries in natural medicine. They work as "adaptogens" and help the body get back into balance. Gourmet Mushrooms also cultivates mushrooms for the nutraceutical industry. For this, they grow the mycelium in a brown bran-like substance instead of sawdust and only use the mycelium, not the fruiting bodies. All their nutraceutical mushroom products are certified organic. Research shows that women who ate a third of an ounce of fresh mushrooms daily (which is only one button mushroom a day) lowered their risk of getting breast cancer by 64%! Gourmet Mushrooms are sold under the MYCOPIA brand and can be found in independent grocery stores and specialty food stores across the U.S. If you know someone who really loves to cook with exotic mushrooms, you can also send them a Gourmet Mushroom Gift Basket. Did you Plant your Peas? The growing season in Northern California always catches me by surprise. One minute it's really cold and the next minute it's hot and I'll be walking down the street noticing my neighbor's 3 foot tall peas growing next to their 2 foot chard! And every year I wonder why I waited so long to start my garden. Well I did it again but luckily I found some beautiful English peas in the grocery store. Peas are so perfect - so beautiful! Without a doubt, frozen peas are more convenient, less expensive and nutritionally equal. After all, they are frozen at the peak of their goodness. 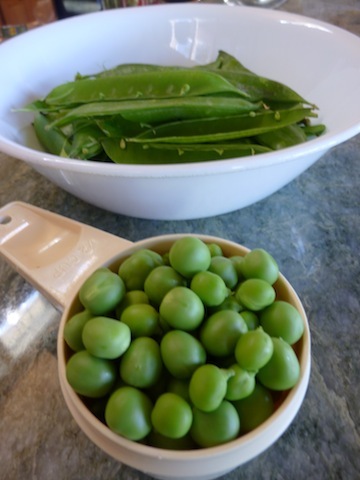 But there's just something about shucking peas that's calming and it certainly connects you to nature more than ripping the top off a plastic bag full of frozen peas. They are really fun to grow, especially when you have kids. They grow so quickly, it's almost like magic! Raw peas, whether they are fresh or frozen, make a good base to thicken raw soups. And eating them raw preserves their high vitamin C content. Try Raw Vegan Split Pea Soup or blend them with other vegetables as in Creamy Raw Vegan Zucchini Soup with Crushed Pistachios. Soak quinoa for 15 minutes. Drain in a fine strainer and rinse in cold water for 3 to 4 minutes. Set aside. Heat oil in a medium saucepan on medium-low heat and sauté onions for 2 minutes. Add garlic and cook another minute. Add quinoa, sweet and hot curry and stir until well coated. Add broth and bring to a boil. Lower heat and cook covered on a high simmer for 5 minutes. Place fresh peas on top of simmering quinoa in a single layer but don't stir in. Cook another 10 minutes or until liquid is absorbed and quinoa is tender. Remove from heat and let sit covered for another 5 minutes. Stir in fresh cilantro. Salt to taste and serve immediately. Per serving: 256.8 calories, 6.3 g fat, 0.8 g saturated fat, 0 mg cholesterol, 9.4 g protein, 41.0 g carbohydrates and 6.4 g dietary fiber. It's Warming Up - Time to Eat More Raw Food! It's been very warm the last few weeks so my raw food consumption is going up. In the spring I try to eat at least half my food raw. 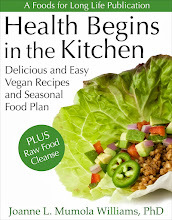 Pretty soon it will be time to do a raw cleanse where I'll eat at least 90% of my food raw for a period of time ranging from a few weeks to a month. So besides enjoying more smoothies, salads, soups and other raw recipes, it's time to make some raw treats! Last year I posted a Raw Chocolate Almond Macaroon which we really love to make. I thought I'd make a vanilla version of these with the added crunch and goodness of raw macadamia nuts. To get them to hold together and make them nice and round, I use a Small Scoop. It's made to scoop 1 tablespoon of cookie dough so it's perfect for scooping up macaroons. Process almonds in a food processor with an S blade until they are the size of crumbs, occasionally scraping down the sides as needed. Add salt and pulse a few times until combined. Add agave nectar, vanilla extract and coconut oil and process until smooth. Add shredded coconut and pulse until thoroughly combined. Scoop out tablespoons of the mixture onto a dehydrator sheet using a small ice cream scoop. You could also just use a tablespoon and form them in your hand before placing them on the sheet. In about 4 hours, when they are easily removed from the dehydrator sheet, transfer the macaroons directly onto the screen. Dehydrate at 115 degrees until they are hardened on the outside but still soft and chewy on the inside. This could take as little as 8 hours total or if you want them a little drier, dehydrate for a few more hours. Check on them so they don't get too dry and hard. Per serving: 102.4 calories, 8.0 g fat, 3.9 g saturated fat, 0 mg cholesterol, 1.4 g protein, 7.2 g carbohydrates and 1.3 g dietary fiber. My favorite holidays involve lots of food and no hassles of gift giving. What's more fun than a holiday involving wonderful Mexican food and margaritas! Here are some recipes for both. 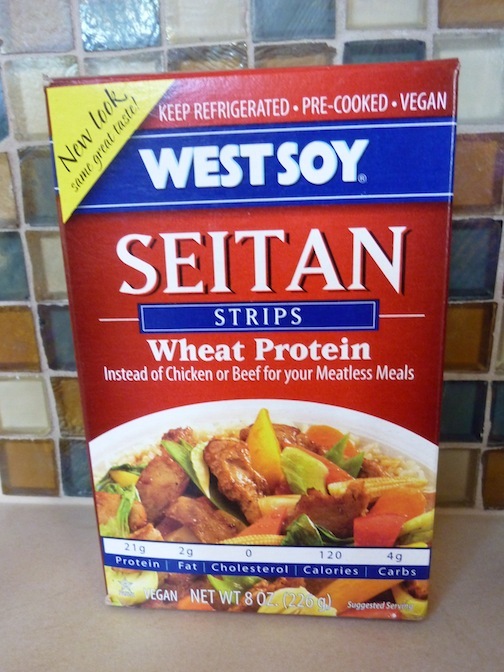 Although it sounds like the devil, seitan (pronounced say-tahn) is actually a meat-like food that is derived from wheat protein or gluten. The traditional way of making it starts with making dough out of wheat flour and water. The dough is then kneaded and rinsed under water to remove the starch. Eventually it becomes a stretchy gluten that is then simmered in broth for an hour or more. You end up with a product that has the texture of meat and one that can take on many flavors. It's low in calories, has no saturated fat or cholesterol and is very high in protein. For vegans who crave the taste and texture of meat, this could do the trick. But it's not for everybody. People with celiac disease or wheat or gluten intolerance should obviously avoid this product. For those avoiding gluten, Butler Soy Curls are a much better alternative. They are made from minimally processed soy beans and are gluten free. Believe it or not, I bought my first seitan product last week. I've had it in restaurants in dishes like "mock duck" but never prepared it at home. 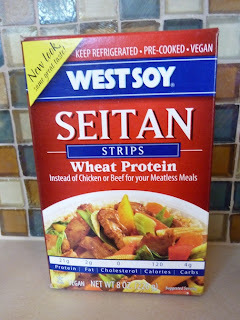 I found some seitan strips by Westsoy at Whole Foods last week and decided to give them a try. A 1/3 cup serving is only 120 calories, has 2 grams of fat, no saturated fat or cholesterol and has a whopping 21 grams of protein. It's also low in carbs with only 4 grams per serving. And although I usually avoid fake meats, this one was quite good and it was the perfect ingredient for my Cinco de Mayo stir fried fajitas! Ingredients include filtered water, vital wheat gluten, soy sauce, garbanzo bean flour, defatted soy flour and garlic. 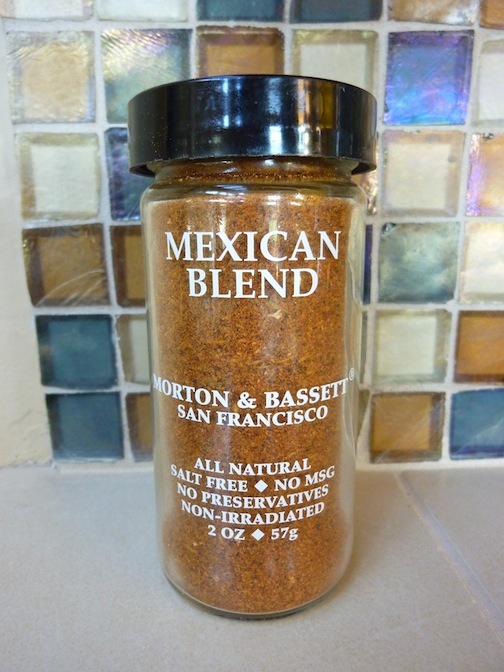 I bid on and won a huge basket of Morton and Bassett spices during a recent fund raiser at the Sonoma Humane Society. Included in the basket was a Mexican Blend that is a mixture of cumin, garlic, paprika, white pepper, thyme and onion. It makes a wonderful seasoning for today's recipe. If seitan is not evenly and thinly cut already, cut into thin strips with a knife or pair of scissors. Place seitan strips in marinade and stir to coat. Let sit for 30 minutes, stirring occasionally. After 30 minutes, drain the marinade and mix it with the water and corn starch. Set aside. Using a wok or large sauté pan, sauté the onion on medium heat for 3 minutes. Add bell peppers and cook another 3 minutes or until they begin to soften. Add jalapeno and cook for another minute. Add marinated seitan, fresh cilantro and corn. Stir a few minutes until heated throughout. Add marinade and water mixture and cook until thickened. Serve immediately with warm tortillas, vegan sour cream, guacamole or salsa, if desired. Per serving (stir fry only): 214.4 calories, 8.8 g fat, 1.0 g saturated fat, 0 mg cholesterol, 15.8 g protein, 19.7 g carbohydrate and 3.1 g dietary fiber. I like Margaritas on the rocks. 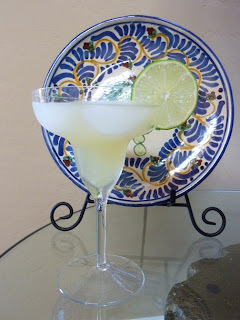 No salt on the rims, no sweet Margarita mixes and recipes using simple syrup which is just a supersaturated solution of sugar and water. I like them tart with just a few simple ingredients. This is a bit more tart than one made from a mix! * Gold is the most adulterated Tequila. It's young and contains color and flavor additives. * Blanco is the purest Tequila. It's clear, aged 2 months or less or bottled after distillation. * Reposado is stored in wood barrels from 2 to 11 months. * Anejo is aged at least 1 year. * Extra Anejo is aged at least 3 years. For a good margarita, I prefer Reposado. Anejo and extra Anejo is more for sipping. Gold is used by restaurants to make frozen margaritas. Blanco also makes a good margarita but is a little stronger than Reposado because it's not aged as long. Our dwindling Tequila collection. It gets smaller every time the kids visit! 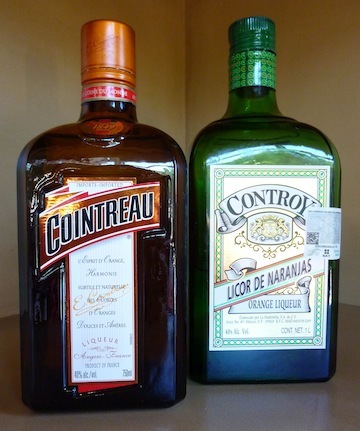 On the left is French Cointreau. On the right is Controy from Mexico. Mexican Controy has more of a bite. Shake with ice and serve in a chilled glass or over ice with a slice of lime. Skip the take-out and prepare this healthy meal in minutes! You're busy and you're tired. Everyone is hungry and the refrigerator is pretty empty. It's late in the week and you've already gone through the fresh produce and haven't had time to shop for more. "Let's just go out to eat!" Sounds easy. So you all get in the car and try to think about where to go. You name 10 local restaurants and try to pick one that has some tasty yet healthy dishes that doesn't cost a fortune. You finally agree on one and stress out looking at the menu. You select something and proceed to give the waiter the third degree. "Are you sure that's made with vegetable stock?". "Please leave out the cheese". "Are the vegetables organic?" "Can you make that with whole wheat pasta?" "Do you have a vegan salad dressing?" "Can you bring me Earth Balance with the bread? Actually, I'll skip the bread." Luckily the owner of the restaurant doesn't throw you out but after you get the meal and the bill, you sort of wish he had. You think, "geez, for that much money, I could have made a lot better meal AND bought a great bottle of wine". You go home in disgust. There are a few key ingredients that I always have in the pantry for times like this. So when you are having a busy week and the only thing left in your refrigerator is one small onion, here's a recipe that you can whip up in less than the time it would take you to get your family into the car. And besides being quick, each delicious serving provides over half your daily requirement of dietary fiber and lots of high quality protein while having less than 1 gram of saturated fat and zero milligrams of cholesterol! Fill a 5 quart pot with water and bring to a boil. After it comes to a boil, add salt and cook pasta according to directions. Do not over cook. While water is coming to a boil and you are preparing to cook the pasta, make the sauce. Heat oil in a saucepan and sauté onion for 5 minutes or until soft. Add quartered artichokes, tomato sauce, Italian seasoning and great norther beans along with their liquid to the cooked onions. Stir and bring to a boil. Then lower to simmer and continue to cook until the pasta is ready. If the sauce is too thick, stir in a few tablespoons of the pasta cooking water. When pasta is done, drain and rinse in hot water. Return to pot. Gently stir in the tomato sauce until well combined. Top with freshly ground black pepper, if desired, and serve immediately. Per serving: 311.8 calories, 5.5 g fat, 0.5 g saturated fat, 0 mg cholesterol, 17.6 g protein, 75.1 g carbohydrates and 14 g dietary fiber.